What If We Applied the Golden Rule? One of the reasons the Old Testament gives for caring for the strangers or aliens living in the land is that the children of Israel were once strangers themselves. The Old Testament and Jesus and Paul in the New Testament all say, “Love your neighbor as yourself” (in fact, Paul says this immediately following the passage in Romans 13 so inappropriately used by Attorney General Sessions). The writer to the Hebrews teaches that we should care for those in prison as if we were in prison with them, and those who are mistreated as if we ourselves were suffering. These are all variations of the Golden Rule: treat others as you want to be treated. What might it look like if we made a good faith effort to apply the Golden Rule to public policy, especially immigration policy? I am frustrated beyond my ability to articulate by all the lies, obfuscation, disingenuousness, misinformation, and dissembling being propagated and repeated by various officials in the administration, especially the president himself. One of the most egregious is blaming the Democrats when his party is in control of Congress and he could personally reverse the “zero-tolerance” decision that has led to family separation. Administration officials have openly described the practice as a deterrent, but what if instead, we addressed the core reasons so many people try to come to the United States? How might the U.S. nonviolently and compassionately help to address some of the root causes of people becoming desperate enough to risk everything, including family separation, to make the journey? We know that many if not most of the countries that undocumented immigrants are fleeing are poor and violent (by the way, I hate the term “illegal alien” because it feels so dehumanizing). As one of the richest and most powerful nations in the world, with a history of welcoming immigrants (“Give me your tired, your poor,/Your huddled masses, yearning to breathe free”), what if the U.S. worked with other nations to create a better and more equitable world instead of alienating other democracies and selfishly proclaiming “America first”? We all live on this planet together and are interconnected more than ever before. What hurts one hurts us all, and what helps one helps us all. A Golden Rule philosophy makes so much more practical and moral sense to me that a zero-sum philosophy where there always have to be winners and losers. Quite honestly, I don’t have the answer to the immigration issue, but I know that the current family separation practice is not the answer and it is not right. It often feels like this is one of those intractable and hopelessly complex issues to which there is no resolution. I think I understand why so many risk everything to try to come to the U.S., but then I also wonder why so many Americans don’t want them to come, sometimes even if they come in legally acceptable ways? The reasons often given include not wanting to give away (or share) limited resources to people who haven’t worked for them, protecting our jobs, or preventing crime – even though the truth is that most immigrants are hard-working, often do jobs that many Americans don’t want, and commit crimes at a lower rate than the rest of the population. I also suspect that a sizable number of Americans are motivated, perhaps despite themselves, by xenophobia (fear and distrust of that which is foreign or strange). Why, really, is it such a bad thing if more people come seeking the same better life our own ancestors did 50, 100, 200, 300, 400 years ago? If we assume that the idea of countries with borders is a good thing, and believe that countries have the right and responsibility to control who and how many come in, then what is the best way to control those borders and protect national interests? 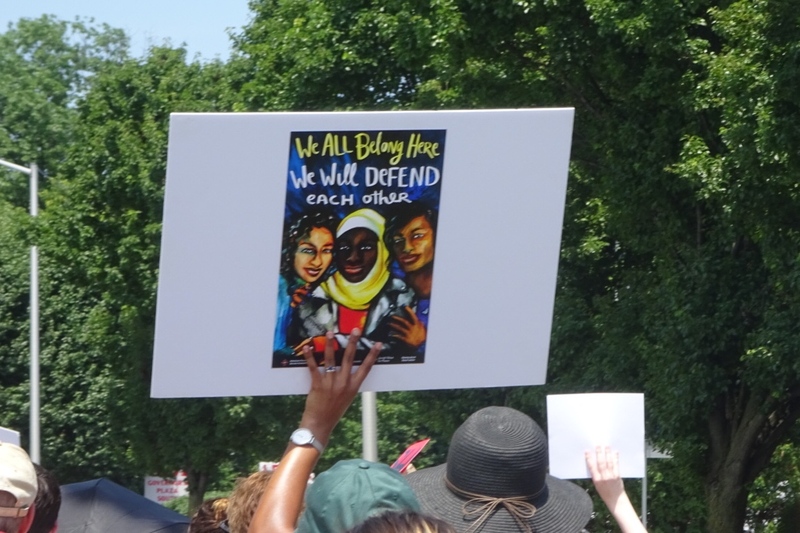 What can we do that is more in keeping with the Golden Rule than separating families, criminalizing people seeking a better life or fleeing war and violence, and building more literal and figurative walls between us and and the rest of the world? I don’t have good answers, but I know we have to try harder to find ones that reflect our national values and the values of our faith. I am horrified and heartsick by the current situation and believe we must do better. *Addendum: A clarification in the interest of truth. I learned that the toddler was NOT in fact separated from her mother, even though they are both being detained for crossing the border illegally. 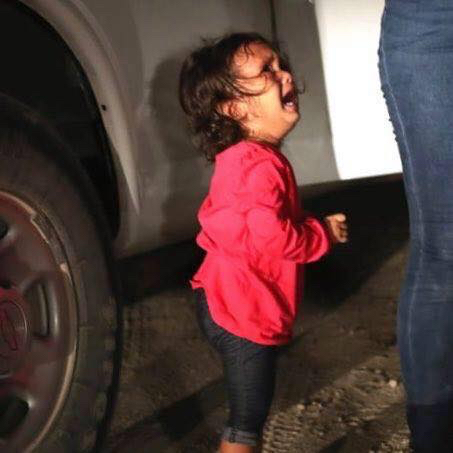 Some people seem to be suggesting that the fact that the child was not separated from her mother negates the value and credibility of the photo and condemns anyone who uses it to put a face on the human tragedy happening at the border. I am very happy that this child and her mother are together, but the truth is that 2,000+ children are still separated from their families and who knows how long it will take until they are reunited or IF they ever will be. Earlier this week, I spoke at the Anabaptist Communicators Retreat, held at the Laurelville Mennonite Church Center, located in the beautiful Laurel Highlands of western Pennsylvania. 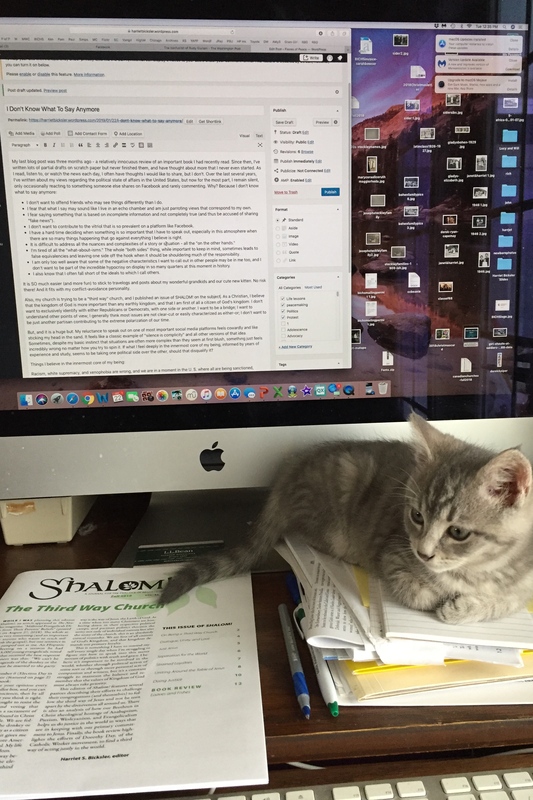 My assignment was to talk about how my faith informs my writing and editorial work. What follows is a slightly adapted version of what I presented. My early writings in the context of the church were borne out of my desire to communicate the call of Christ to be peacemakers. I grew up in the Brethren in Christ Church, one of the historic peace churches, but it wasn’t until young adulthood that I internalized the peacemaking imperative for Christians and developed what has been a decades-long passion for promoting the practice of peace and justice, particularly in the context of the church. In the earlier days of my writing on peace and justice topics, I was probably somewhat preachy and “polemical” as I tried to persuade others of my own convictions. Those early writings were freelance and expressed my personal beliefs and opinions, but then I took on various writing and editorial positions in the church that gave me the opportunity to combine passion with profession, and I learned that while there is definitely a place for polemical writing, I could be more effective and likely have greater influence over the long term by making the case with more grace and humility. I list all those not to toot my own horn but rather to illustrate the different genres and contexts in which I’ve worked. Throughout it all, I’ve also worked with and edited many writers, most of whom were gracious to me as their editor, and I’ve navigated the challenges of trying to fairly represent many views in the publications I edit while maintaining my own integrity. Three imperatives from those passages serve as guidelines for how I try to do my work: 1) treat others as you want them to treat you; 2) if it is possible, live at peace with everyone; and 3) speak truth with words that give grace. I’ve collapsed a couple verses into that third guideline, but it seems in keeping with the intent of the passage, and it expresses well what I strive to do. It’s the basis for the title of this presentation: speaking truth with words that give grace. Living up to those words is a constant challenge. As I said, much of my writing and editing has been on peace and justice-related issues, where there are often strong differences of opinion and convictions, even and perhaps especially among Christians. This has always been true, but seems particularly pointed right now. We’re living in a world where there is so much that seems unjust and just plain wrong, where lies and distortions of truth are some people’s stock-in-trade, and where religious and political divisions often seem impossible to bridge. It’s hard to speak the truth as one sees it in a way that will not further inflame and divide. It’s hard to extend grace to others who see that truth differently. But I believe more than ever that it’s important to try because it’s part of what it means to be a peacemaker. How does this actually work itself in my writing and editorial practice? I consider my audience, recognizing that there will be some who read or hear my words who are not at the same place I am, who disagree with me (perhaps vehemently), and so I temper my words. A real-life example: When I used to write promotional announcements for my congregation’s annual Peace Sunday observance, I always visualized an older gentleman who was very conservative and was not always supportive of all the ways we tried to emphasize the church’s commitment to peacemaking. Thinking about him as I wrote helped me frame the announcement in a way that was most likely to appeal to the compassion that I knew was in him and not bias him and others like him against our Peace Sunday efforts from the get-go. I often acknowledge my own lack of knowledge or understanding and that I could be wrong. While I have strong beliefs and opinions, I don’t see many things as black and white or either/or. Life usually presents itself to me in much more complex and ambiguous ways—in shades of gray rather than in black and white, as both/and rather than either/or. Even those things about which I have strong opinions are not always clear-cut. In my experience, there are not many genuinely easy answers. I try to be honest and truthful. I fact-check and use reputable sources. I also try to be honest about my own shortcomings, which are many. While I’m pontificating about this or that topic, I am often brought up short by the realization that the hypocrisy, inconsistency, and self-righteousness I’m attributing to others could perhaps be applied to me. I am constantly humbled by the words of Paul in 1 Corinthians, which in one translation read: “For this reason I have sent to you Timothy, my son whom I love, who is faithful in the Lord. He will remind you of my way of life in Christ Jesus, which agrees with what I teach everywhere in every church.” To paraphrase it personally: Does the way I actually live my life agree with what I write? . . . the answer to which often gives me pause and reminds me that a little humility is a good thing. I try to be true to myself, and use personal stories to illustrate my point. It’s harder to argue with personal experience. That’s the way I framed an essay called “God Bless the Whole World, No Exception,” that was something of a rebuke of the “America first” mentality.” I told the story of having been integrally connected to three countries from the moment of my birth. I am the daughter of an American mother and a Canadian father, and I was born in Southern Rhodesia (now Zimbabwe). That reality has forever affected the way I view the world. Conversely, I recognize that the personal experience of others also affects the way they view the world. I try to acknowledge other points of view when I can. This is a particular challenge when those points of view feel like anathema to me, or when they contradict the official position of the church for which I’m writing or editing. As an editor, I believe in doing my best to maintain the writer’s own voice. Sometimes that probably means that I am not as ruthless an editor as some might think I should be, but it is also a gesture of respect for the right of people to express themselves in the words, phrases, and colloquialisms that are comfortable for them. I don’t like it when editors put words in my “mouth” that I would not say but that express what they think I mean, and so I try not to do that to those whose words I edit. I confess that many many times over the years I have struggled with “speaking truth.” I hate conflict, and I’m an introvert, so I would just as soon run the other way as confront the conflict. I have remained silent when I should have spoken up (or written something). I have also struggled with the grace part, as I feel anything but full of grace for those whose words and actions I abhor or cannot support. Nevertheless, despite my failures, speaking truth with words that give grace remains a goal for the way I want to approach my writing and editorial life, as well as the rest of my life. Every Man Dies Alone: Why Resist? I discovered the 1947 novel Every Man Dies Alone in a conversation about books with a friend on the beach in Cape May. The novel was written in the aftermath of World War II, by Hans Fallada, the pen name of a German named Rudolf Ditzen with a history of mental illness and substance abuse who spent time in mental institutions, prison, and rehab. He wrote the book in 24 days in September and October 1946, but died before it was published in 1947. In 2009, when the English translation was finally published, the book gained a whole new audience, becoming one of the New York Times “notable books of the year” in 2009. I’ve read lots of novels set in part during World War II: All the Light We Cannot See, Life after Life, Everyone Brave is Forgiven, Lilac Girls, Moon Tiger, The Girl from the Train, and The Paris Architect are a few relatively recent ones. Each of those novels portrayed some aspect of the war that I didn’t previously know much about. However, it’s been awhile since a novel has made me think and engage in self-examination as much as Every Man Dies Alone, likely because of the times we are in and the questions I ask myself regularly about how to respond to many things that are happening in the world that seem to me to be so very wrong. 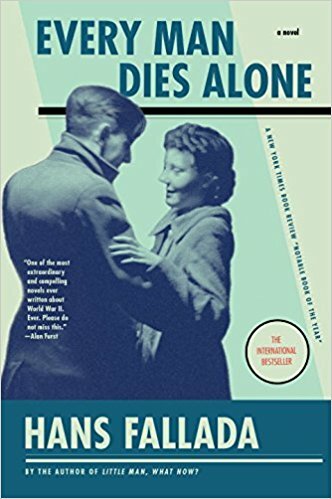 Based on a true story, Every Man Dies Alone is about an ordinary German couple, Otto and Anna Quangel, who resist Hitler and the Third Reich. Their act of resistance is carried out in an environment in Berlin where many ordinary citizens believed the hype that Hitler really was ushering in a new era of German greatness (making the awfulness of the war worth it); they willingly spied on and reported neighbors who acted suspiciously. Others became part of the system of oppression as police and members of the Gestapo. Still others were skeptical and privately opposed Hitler, but because they were afraid of the Gestapo, they remained silent or turned in anyone they suspected of acting against the government. Any kind of dissent was treasonous, and people were arrested, imprisoned, and executed for minor offenses. Anna, angry and sick with grief over the death of her son, initially says the act is too small and won’t do any good, but agrees to participate. Otto convinces her: “They all will read the card, and it will have some effect on them. Even if the only effect is to remind them that there is still resistance out there, that not everyone thinks like the Fuhrer.” Later he reflects again on the possible success of their efforts: “I’d like to be around to see it [Hitler and the Third Reich] all collapse. I would like to experience that. We’ve done our bit to make it happen.” Together, they imagine that their postcards will change minds and create a larger movement of resistance. Ultimately, after more than two years of postcarding Berlin, they are discovered and arrested, brutally interrogated, charged with treason, tried and found guilty in a farce of a trial, and sentenced to death. Otto is executed by beheading, and Anna dies later during an air raid when a bomb falls on the prison. After his arrest, Otto is devastated when he learns that out of 285 postcards he wrote, only 18 were not turned in to the authorities. He is at first convinced that nothing good was accomplished, that their act of resistance was a complete failure. Eventually, as he languishes in prison, he comes to understand the value of his act of resistance and before he dies attains the kind of serenity that comes from knowing he did what he thought was right. So what is the point of resisting when the act is so small and/or it stands almost no chance of being effective in the long run? Several conversations in the novel sought to answer that question and resonated with me as I ponder how and whether to resist the many things that are wrong in the world these days and often wallow in feelings of powerlessness and helplessness. At one point, Otto and Anna’s son’s former fiancee Trudel and her husband Karl consider hiding a Jewish woman in their house. Karl says, “There’s nothing we can do,” to which she responds, “If everyone thought like that, then Hitler would stay in power forever. Someone somewhere has to make a start.” The narrator continues: “She was desperate to do something against Hitler, against the war. In principle, he was too, but it mustn’t carry any risk; he wasn’t willing to run the least danger.” I ask myself: what risks am I willing to take to do what is right? Dr. R. responds: “No, you don’t. And a saying like that is justification for every form of brutality!” An argument for nonviolence if there ever was one. 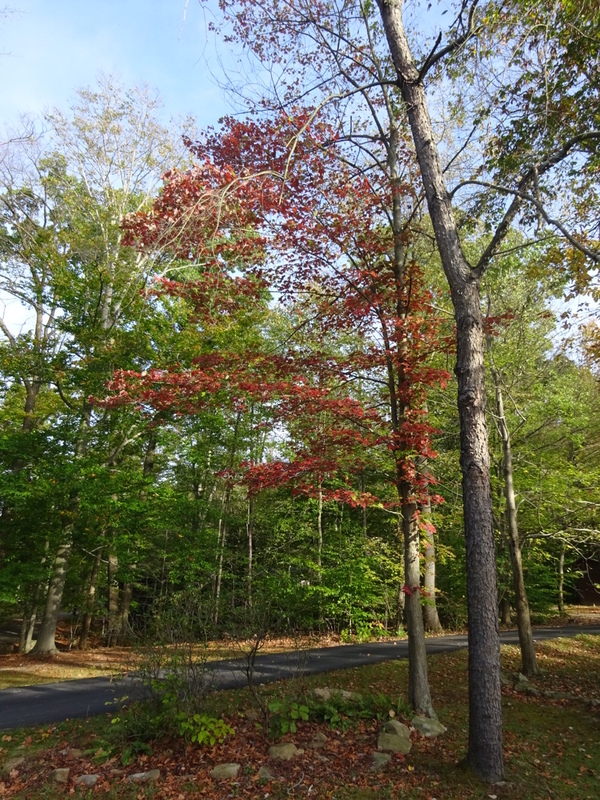 I need that encouragement and challenge right now, when I feel helpless against a barrage of what I believe are unjust, mean-spirited, self-centered, short-sighted, hypocritical, and racially-charged attitudes, actions, and policies. I want to stay decent and act with integrity, and to be able to believe that in the end decency, goodness, love, and justice will prevail. *Disclaimer: The book, clocking in at more than 500 pages, is much more complex with many more characters than this summary and analysis would indicate. It’s a gripping story, with lots of suspense – in short a good read!